The arts help to sustain a healthy cultural workforce and assists in making Phoenix a great place to live, work and visit! Great cities feature great public art. Within its 516.7 square miles, Phoenix proudly features a spectacular Municipal Art Collection. Phoenix has one of the best public art programs in the nation, thanks to the City’s willingness to commit 1 percent of its capital project costs to public art and to its innovative spirit in incorporating art into design. But we know that Public art, like any capital project, needs to be maintained, or this investment in our community could be wasted. 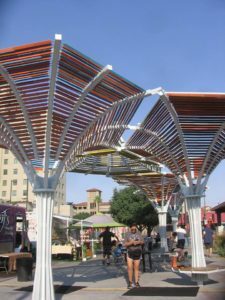 The Public Art Program is funded through an ordinance that allocates one percent of the Phoenix Capital Improvement Program to enhance the design of public buildings, infrastructure and spaces. In the past 30 years, it has created more than 180 projects and become a national leader in developing unique collaborations with artists and other design professionals to help make a better city. The projects range from new parks, community centers and canal trails, to bridges, streetscapes, overpasses, transit centers, recycling centers and other key infrastructure. 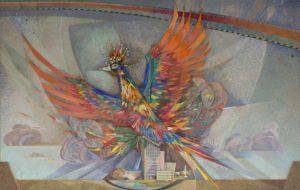 Each year, the Phoenix Office of Arts and Culture works with City department leaders, the Mayor, and City Council to develop the annual Public Art Project Plan that identifies capital improvement projects in all areas of Phoenix that offer the greatest opportunity for artist involvement and public accessibility. The total budget for each project includes funds to contract for design, fabrication,installation and project administration. Art projects, similar to other public works, are funded in part through City-issued bonds and other capital sources. The projects are scheduled to be in step with the City’s priorities. City Council currently appropriates funds annually for maintenance. Train enhance the beauty of our city. Phoenix has created more than 190 site-specific public art installations in communities throughout the city during the past 30 years, accessible to the public. bridges, buildings, streets and canalscapes. Much of the public art work is performed by talented teams from local construction trades, including concrete workers, masons, electricians, painters, steelworkers and more. During the past decade more than 1,600 local workers have helped to build public art projects throughout Phoenix. 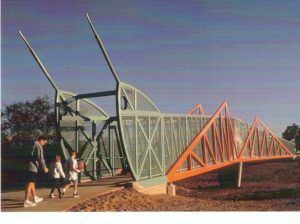 Friends of Phoenix Public Art supports funding for ongoing maintenance and care of our city’s public art – treasures of art and culture belonging to the residents of Phoenix. Similar to properly maintaining a home, business, vehicle or important equipment — public art is a valuable asset to our city. Each public art piece needs to be properly cared for, to avoid becoming damaged or in disrepair. We support Portable Works Preservation to maintain 1,200 pieces of donated art, some pieces given to the City prior to statehood, displayed in municipal buildings and the Gallery @ City Hall. We support Site-Specific Public Art Maintenance. This includes maintaining more than 190 site-specific public artworks embedded in neighborhoods and city buildings throughout Phoenix. 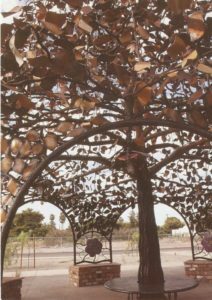 This diversity of outdoor art includes freeway overpass bridges, bus stop and light rail shade structures, and iconic art sculptures such as “Her Secret is Patience” in Civic Space Park. We support Innovative Temporary Public Art Installations attracting thousands of residents and visitors. We support Public Art Educational Programs including public installations at our beautiful Gallery @ City Hall – right here at the heart of our city, where municipal commitment to a vibrant city is front and center. You may not know that Phoenix hosts one of the few City Hall museums throughout the U.S. Our city’s vast collection of portable public art belongs to YOU, the public. Access the the Gallery @ City Hall is free and open to the public. 2. 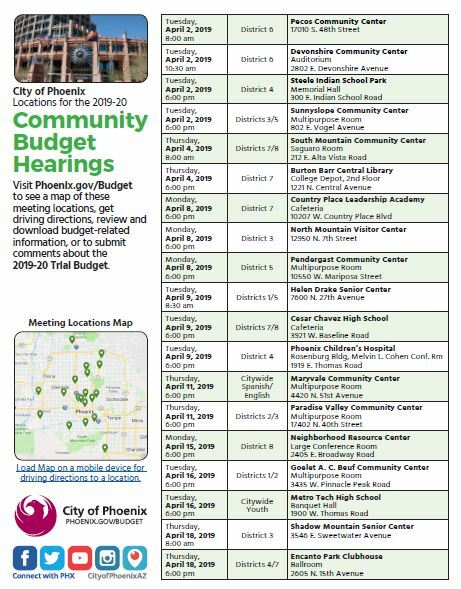 Write a letter to your council member, make a phone call or a personal visit in lieu of a budget hearing. Then, follow up with a thank-you card after you present.